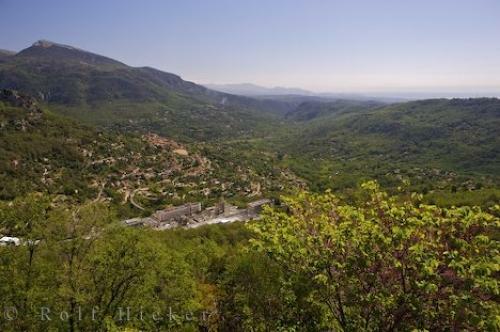 The lively panoramic view of the tiny village of Pont du Loup in the Gorge du Loup, Alpes Maritimes in Provence, France. The very beautiful Gorges du Loup in the Alpes Maritimes in Provence, France is 12 kilometers from Grasse and the D2210 road travels through little Gorge villages, including Pont-du-Loup in the commune of Tourrettes-sur-Loup, Provence in France. In contrast to the village of Gourdon which sits on a rocky ledge 500 meters above the Loup River, the tiny Pont-du-Loup is down at the bottom of the valley where the Loup River surges out of the Gorge into a more gentle landscape. In 1840, when the little place was known as Patarast, a little cafe was opened and it began to be known to travelers. In 1892 the railway viaduct was completed and the village name was changed to Pont-du-Loup. During the Second World War the village was one of the many occupied by the Germans, and the viaduct was bombed. The remaining tall pillars tower over the old buildings of Pont-du-Loup in Provence. Photo of the Gorge du Loup, and the village of Pont du Loup in Alpes Maritime, Provence, France in Europe. ... Candy factory was established and the 'Confiserie des Gorges-du-Loup' is still producing their delectable candied fruits in the building on the bank of the Loup River. The 'Purchase room' is open during lunch rime from February to October, and there is also a Florian candy factory in Nice. The breathtaking beauty of the Gorges-du-Loup in Provence, France and the charming villages such as Pont-du-Loup should be a 'must' on one's travel itinerary. Overview of Pont du Loup, Gorges du Loup, Alpes Maritimes, Provence, France, Europe. I photographed this photo with the digital SLR camera model Canon EOS-1Ds Mark II, aperture of f/8.0, exposure time of 1/125 sec. on ISO 100, as always I used a original Canon Lens, the focus lenght for this picture was 25mm.